A home with beautiful sash windows is something for everyone to be proud of. However, if a window develops problems, it may not be a simple repair. Plus, older windows may need restoring and there is a trick to doing this kind of job right. 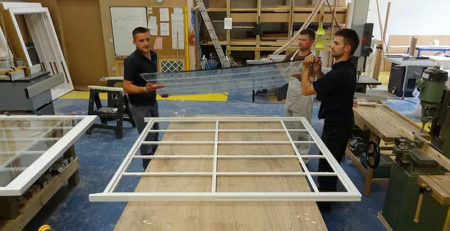 Here are some helpful tips for sash windows restoration from your London window professionals. To properly restore old style windows, you must dismantle them. This can sometimes be harder than you think. Plus, with this kind of job, you may need to disturb the walls around the windows, and redoing the walls afterward, may be a good idea. You may need to cut out some of the wallboard to get to the sash assembly. If this is the case, you must be very careful and make a clean cut. If not, redoing the wallboard may no longer be an option, it may be mandatory. Remove as much paint as possible (that is covering the trim and facing). Take your time when removing window facing, and use a sharp utility knife to cut through old paint. Next, carefully remove the facing, making sure it stays intact. It doesn’t matter if the old sash cord is broken or not. It’s always best to replace it, so you do not have to disassemble the window unit again in the near future. When possible, buy all new parts for the window. If you cannot find new parts, remove all the old ones and clean them thoroughly. Remove the weights from the old cord. If the cord is broken, you may need to tie a string to the part left in the window, to make it easier to install the new cord. Put some silicone on the pulley and make sure it is clean. If there is no cord in the window, you might have to use a string with a weight (nut or bolt) and feed the string over the pulley and into the wall. You can then use the string to install your new sash cord (by attaching the cord to the string and pulling it through). Replace all the trim and put everything back together. If the window is in poor condition, you might have to remove it from the wall. Take your time and carefully pull out all the old trim. Do this slowly, so you do not crack or break the trim. Yet, in most cases, you can restore a window without removing it. This is the time to replace any cracked or damaged glass panes. Make sure to take exact measurements for your glass, as it must be the exact size. Buy quality glaziers putty, so you will not have to replace it very often. These useful tips can make our sash window repair and restoration a little easier. Of course, the best way to restore a window is to contact your local window service. They take care of all the hard work, clean up, and can give you beautiful new windows in no time.